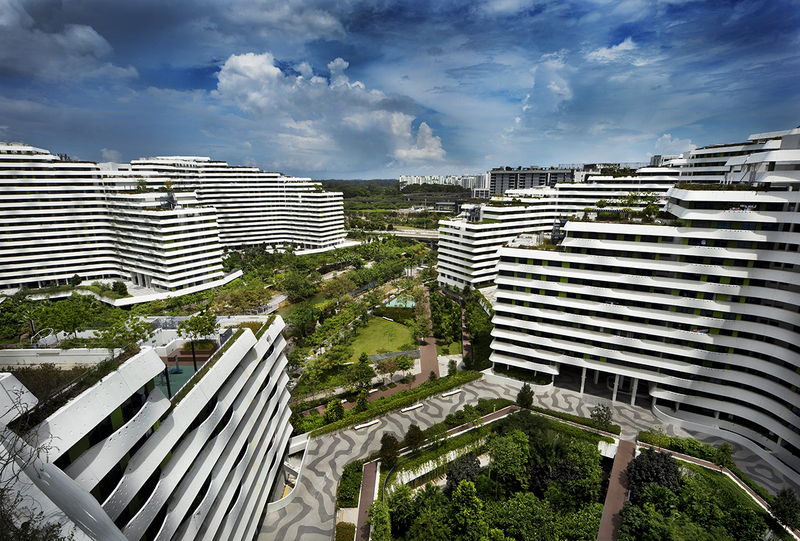 Looking to the future whilst looking back to the past, the Punggol Waterway Terraces form a blueprint for 21st century sustainable mass housing and mark a return to Singapore’s original ethos of community pride and identity. The original SIT public housing blocks were tropical adaptations of contemporary clean-lined modernism. As they were designed well before the advent of airconditioning, the apartments required cross-ventilation, they were shaded by overhangs, and were orientated to avoid the heat of the afternoon sun. 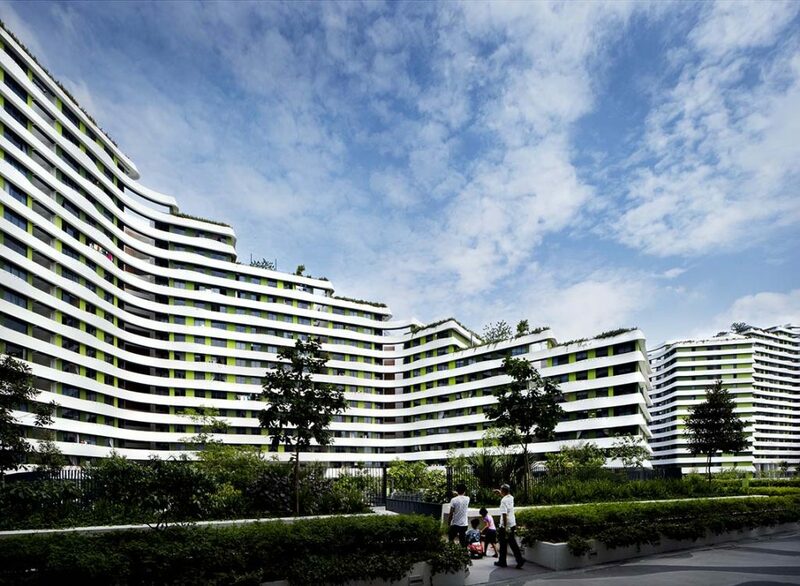 When the first large-scale HDB blocks were built in Queenstown in the early 1970s, that ‘tropical-necessity modernist-design’ architectural hybrid symbolised a newly independent Singapore. As Singapore grew more affluent and as global architectural fashions changed, those heroic tropical-modernist forms were to quietly disappear. 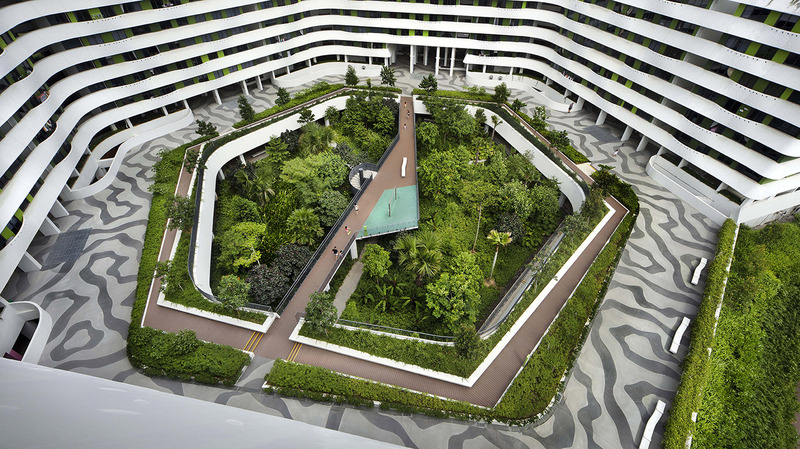 They were replaced by an architecture that itched to assert Singapore’s worldliness, but the designs became increasingly generic, many of the developments were implicitly anti-social,and the structures were unsustainably non-tropical. However, in the face of global warming and the loss of community identity, the pendulum has swung back to the principles and the spirit of tropical-modernist design, especially in the field of public housing. The sheer mass and the fundamental design elements of the Waterway Terraces are not hidden, they instead are presented to the public and the residents as an unequivocal response to the 21st century requirements for a sustainable, yet enjoyable, high-density urban lifestyle. 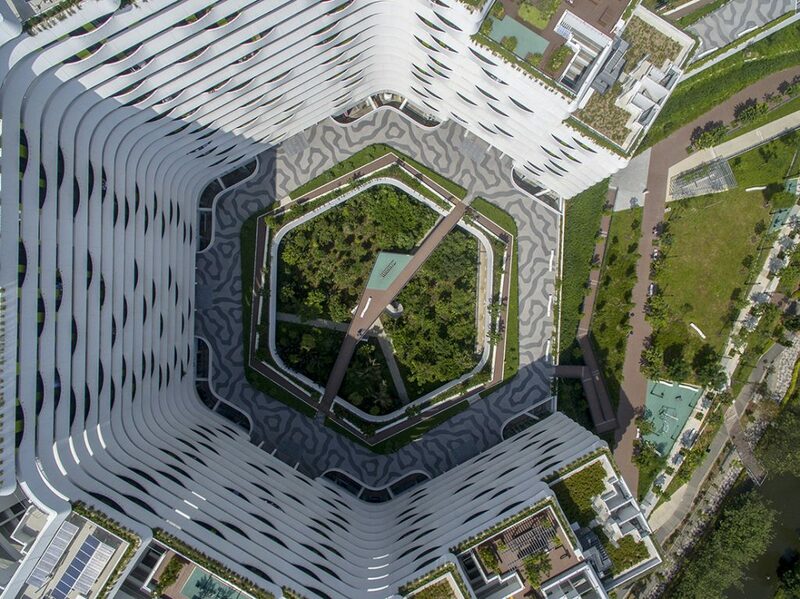 A matrix of planning strategies provides passive climatic control – cross ventilation and shading from the sun – whilst maximising the orientation of the apartments towards the waterway that bisects the site. 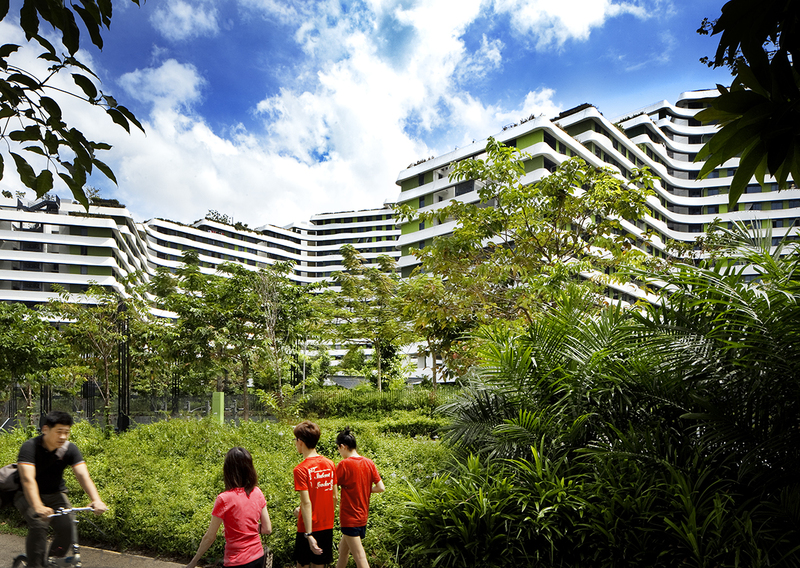 Set upon linked hexagonal plans, the ‘arms’ of the blocks step down to the waterway as terraces, so all the residents have a direct experiential connection with the landscape and with their neighbourhood. 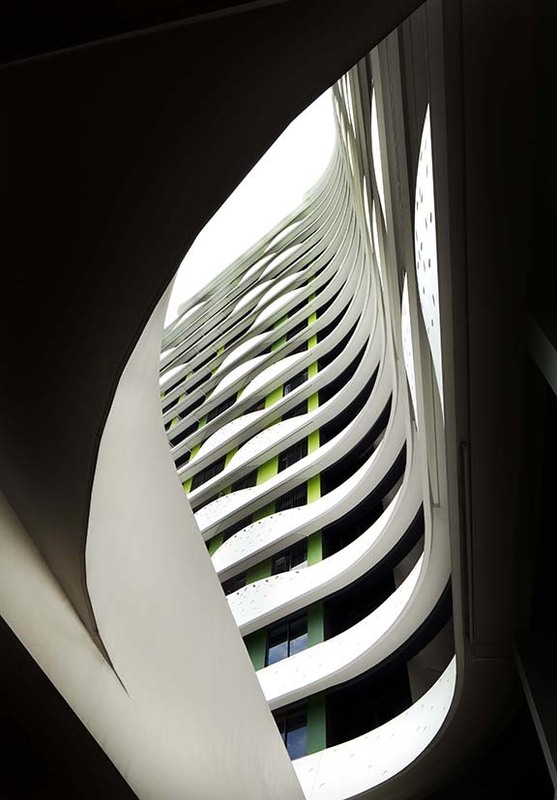 The apartments are shielded from the heat and the rain by undulating ribbons of ‘Juliet’ balconies, which perform as decorative sun-shading devices. A continuous no-dead-end corridor runs the length of every floor in each of the two sectors, and by virtue of an ingenious planning manoeuvre, the double-loaded corridors actually facilitate cross-ventilation and vertical cooling, instead of blocking the airflow to the apartments. 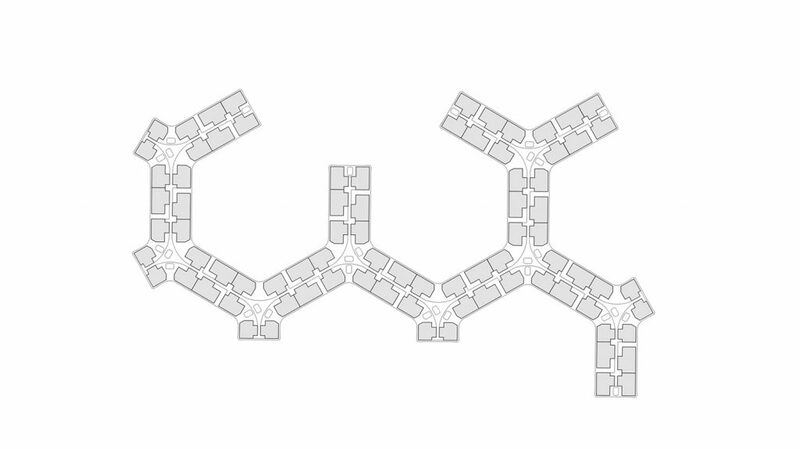 Due to the hexagonal block plans, three corridors are angled at 120 degrees from the lift cores to serve apartments grouped in threes. Each apartment is directly ventilated by the lift-core breezeways and by voids inserted between the groupings. The fundamental principles of passive tropical design have been inventively recalibrated and then expressed at a monumental scale, whilst the contextually-attuned planning and massing have reintroduced a sense of communal identity at a human scale. Waterway Terraces is a genuine precursor to the zero-energy mass housing that will be essential for the continued growth of Asia’s cities.